Just a week ago, the storm clouds were brewing over Stamford Bridge prior to the arrival of Manchester United for an FA Cup tie. 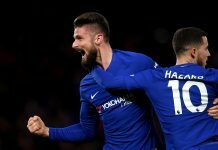 Just one week later, Chelsea are staring at a turnaround that has seen them force a replay against United via a 2-0 comeback, overturn a 1-0 deficit in the Europa League, and defeat a West Ham side 2-0 on Sunday with a performance that was much better than the scoreline suggests. Frank Lampard, marking his return to the squad after being rested against Steaua, netted his 200th goal of his Chelsea career and Eden Hazard added a second against a West Ham side that were routinely overmatched by the quality of their opposition. However, Demba Ba will rue the chances he spurned, as he opened up the deluge of scoring chances in the sixth minute. Lampard’s defense-splitting pass found Ba break a failed attempt at an offside trap and sent him one-on-one with Jussi Jaaskelainen. However, he could only poke the ball wide of the right post with a tame effort once he opened his body. Lampard, the goal-scoring machine, would show him how to finish properly 10 minutes later after a brilliant piece of work by Eden Hazard. The Belgian’s initial shot from just outside the 18-yard box was parried wide by Jaaskelainen, but the rebound fell to Victor Moses. Another blocked shot put the ball straight back at Hazard who with a deft little lob found the head of Lampard who finished with aplomb and sent the Bridge faithful into raptures with his landmark goal. It leaves Lampard just two goals from the club record of 202 goals set by Bobby Tambling, and it’s hard to argue that he shouldn’t have had a hat-trick by the end of the match. The second goal, though, would be added by the brilliance of Hazard and Juan Mata. After a brilliant display of talent where Hazard was surrounded by three defenders and managed to leave them all for dead, a quick one-two with Mata was played over the top for Hazard to chest down, skip into the box, and unleash a low drive across his body with his left that Jaaskelainen was powerless to stop. 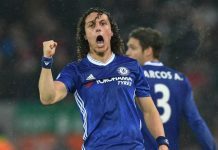 The Blues continued to press for a third that would seal the match, and Lampard should have added a second with a trademark sweeping finish as Cesar Azpilicueta’s cross found him just inside the box. However, in un-trademark fashion, Lampard swept the ball over the bar. Demba Ba then had a chance to make it three on the counter as he was released down the right hand side, but he dallied on the ball too long, and Winston Reid was able to cover. West Ham’s first real chances came late on, and it would have produced a bit of nerviness around Stamford Bridge. Carlton Cole evaded Gary Cahill in the 83rd minute to get a foot on Matthew Jarvis’ cross, but could only fire straight into the hands of Petr Cech. The victory for the Blues was vital given the way the weekend played out. With the defeat of Tottenham and Everton’s win over Manchester City, the Blues find themselves 1 point ahead of Spurs and 5 points ahead of Arsenal, while just 4 points behind Manchester City for second. Let the race begin.